Move along the length of the Karaboudjan using the grappling hook! Beat Red Rackham in a sword fight! Get through the storm safely and reach the desert! Beat Giant Rackham a first time! Destroy Giant Rackham and the galleon! Finish every level of the three types of PLANE challenges! Finish all the SWORD challenges! Finish all the SIDECAR challenges! Finish all the platinum challenges! Collect all the crabs with golden claws! 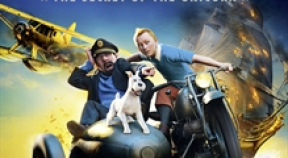 Find all the TREASURES in "Tintin and Haddock" mode! With Snowy, find all the buried objects in "Tintin and Haddock" mode! Get gold in all three types of PLANE challenges! Get gold in all the SWORD challenges! Get gold in all the SIDECAR challenges! Pull five enemies off a ledge you’re hanging onto! Sir Francis: use the armor to knock out 20 enemies! Give your partner 5 leg-ups in "Tintin and Haddock" mode! Castafiore: do 45 spinning attacks! Thom(p)sons: get rid of 22 enemies with your stick! Knock out 10 enemies with a painting of Sir Francis! Make 15 enemies slip on a banana skin! Knock out 5 enemies with a chandelier! Throw a pot at an enemy's head! Get rid of 2 enemies at the same time with an exploding object! Knock out 2 enemies in a single throw of a ball using a rebound! Finish a Tintin & Haddock mode level without losing any coins! (Apart from the side-car levels). Bounce 10 objects off Thom(p)son's cane! Catch an object in full flight with the grappling hook! Change characters in flight with the parrot! Finish "The mystery of the talking bird" in less than 3 minutes 30 seconds! In the PLANE challenges, stay near the water for 7 seconds! Finish a SWORD challenge without getting a scratch! Finish a SIDECAR challenge without crashing into a wall or obstacle!